The tweets are circulating, the facebook event page is up, and the website is online. Taco Day 5 is nearly upon on us. Taco Day is a 12-hr taco party where you bring something to drink, some money for charity, and you eat free tacos, this much is clear.Â But what’s isn’t always clear for folks who come across the event, is the concept behind Taco Day.Â Who is this communitasPHX group that puts it on?Â What is it about? Is it really free? What’s the point? To be honest, for most Taco Day participants, answers to these questions aren’t that vital.Â The combination of the words, “party” & “free tacos” are enough to secure their participation. But for those unfamiliar with Taco Day and those who haven’t been to one of the 4 previous Taco Day’s, these questions linger.Â So here’s a behind the scenes look at Taco Day – a glimpse into the what and why behind the annual event. For my wife, Kelli and I, Taco Day began about 7 years ago.Â While living in Southern California, some friends invited us to an all day Taco Party. Apparently, two buddies who had birthdays close to each other, decided to celeb rate their birthdays together by throwing a party for all of their friends.Â They decided that instead of people giving them gifts, they would instead “give” their community of friends tacos – all day long.Â This crazy but brilliant idea became an annual excuse for all their friends to be together and to celebrate the sense of community between them.Â It was a simple, but powerful expression of what human relationships could look like. As we moved our family back to Phoenix-metro area 5 years ago, Taco Day was something we knew we had to start in the desert.Â So in 2005, we hosted Taco Day Uno at our home in Mesa. Opening up our house for 12hrs and having all our friends of our friends a hundred or so tacos could have easily been an overwhelming and exhausting experience.Â But it wasn’t.Â Something was beautiful about all of our friends stopping by, about us making tacos for them, and about connecting friends from different circles with each other.Â The whole event was life-giving to us and gave us a new purpose as a family who wanted to promote and model new, hopeful, and generous ways of human interconnectedness. As we enter our 5th year of Taco Day here in Phoenix, we’ve moved the event (and our family) to Downtown Phoenix, a vibrant and developing part of town that’s know for it’s counter-cultural people and creative expression. At Taco Day Cuatro, we had over 170 friends eat over 800 tacos and helped us raise $1200 for the Laundry Love Project – a local initiative serving the working poor.Â Even with all of this growth, we can’t shake the feeling that Taco Day is just getting started. We hope to soon give the idea away to others looking to host Taco Days wherever they live across the country (or world). For now, though, we’ll focus on making this year’s event as special and as unique of an experience as any previous Taco Day. What’s not to like about friends, free tacos, and supporting a good cause? First and foremost, Taco Day is an experiment. In a world that seems to be increasingly isolated and individualistic, we wanted to get people together for a common good. There is something deep inside each of us that enjoys connecting with those we share our city and neighborhoods with. There is something inside each of that is interested in getting to better know those who see the world a bit differently than we do. This diversity of perspective challenge the ways in which we relate to one another and demand that we live more hospitable toward one another. And as we better understand each other, we learn how to exist and to work together to meet the unique challenges of our city. 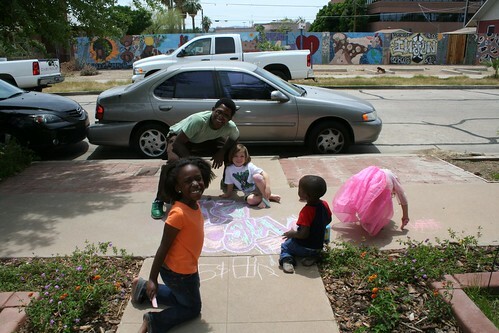 CommunitasPHX is a local non-profit based in Downtown Phoenix that seeks to cultivate spirituality, community, justice, and creativity in the city. With initiatives ranging from a collaborative art/music/workspace (fractal) to grassroots work with the working poor (The Laundry Love Project) & the homeless (On Bikes with Love), communitasPHX hopes to offer fresh and creatives alternatives to the way in which we live and relate to one another. For the communitasPHX community, Taco Day has become a way in which we can model radical hospitality and inclusive generosity. Those involves with the movement help plan, pay for, set-up, and clean-up Taco Day each year. Our hope is that this simple gesture illuminates a new path of community, hospitality, and generosity for our neighborhoods and cities. YOU are invited – all are welcome to this event and the more the merrier. 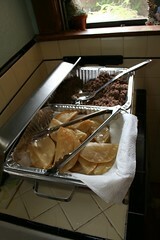 So bring some friends with you as well as some drinks to throw in a cooler to share with the the Taco Day crowd. If you can, bring a few dollars to support the work and efforts of communitasPHX. It’s 12hours long (10am-10pm) – you really don’t have a good excuse not to come. Your cousin’s wedding doesn’t last all day. You aren’t scheduled to work the entire time between 10am-10pm. You can stop by for 5 minutes or you can stay for 12hours – it’s up to you. Eat tacos for breakfast – we don’t care when you come, we’d just love for you to be a part of Taco Day. ALL money donated will go straight to the various initiatives of communitasPHX. Donations help us dream of new programs to run out of our community artspace (fractal) and will help us start new LLP’s and OBWL’s around the city. It’s good stuff that’s making a difference in the City of Phoenix. We’d LOVE to have you join us for Taco Day 5.Â You’ll find all the specifics of the event on the Taco Day website (http://www.tacodayaz.com) or on the Facebook event page. when is it this year and where is the new place?